This oddball practice is grounded in the earth, so to speak. Dig into a hillside and you’ll find a queer mixture of arable soil and hard rock – hardly, to the untrained observer, ideal ground to grow grapes, much less grapes that are to be fermented for fine Italian dinners and charity events in million-dollar foyers. But the untrained observer doesn’t know (and why should he?) that grapes, more than quality soil, demand warmth, and will not fully self-actualize without conditions conducive in this regard. And what our observer is even less likely to realize is that rocky soil, especially shale, has a knack for heat retention to rival the best in German insulation. The grapes, simply put, like it hot, and the hills are alive with the music. And so, in the interests of high society and low culture, for diplomatic dinners and paper-bag binges, the Weinmachers of the world plant, prune, and harvest on slopes better suited for sledding. Someday long past, when deforestation techniques were no doubt less advanced than today, the hills of Europe were stripped of their lumber, and their blank faces repainted with row after row of grapevines, parallel strokes to be carefully drawn and painfully tended, for the good of the human race. Who were these nameless heroes, laboring under Sisyphean conditions, planting seeds practically from the riverbed to within yards of the mountain’s summit, clipping the vines all summer, and selecting during harvest, grape by grape, the final cut? Were they peasants, or artists? 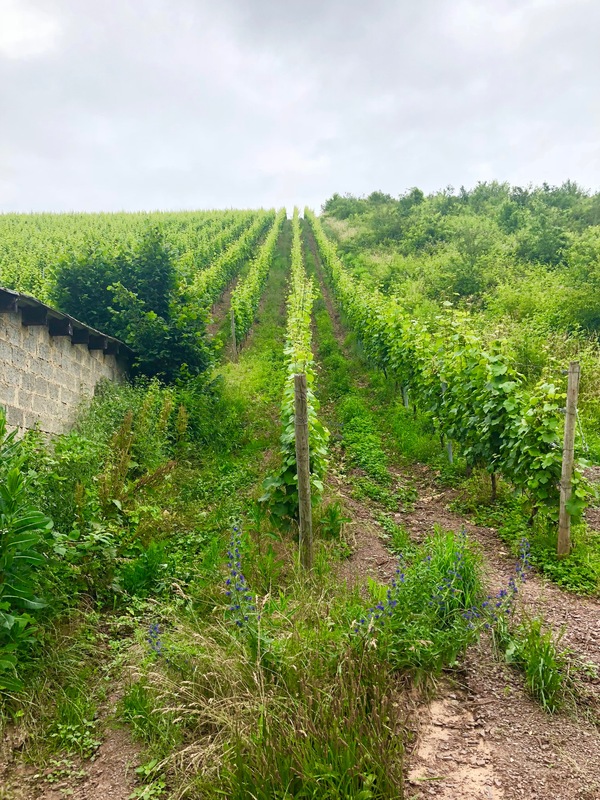 Did they have a dream, a great passion, for making the best half-dry white in town, nay, the best half-dry white produced on either side of the Rhine River? It’s more likely they worked for somebody with some such conviction, and reshaped the valleys of Germany not for a vision, but for a paycheck. Such is often the case in the course of human history – bourgeois prophets crusading against reason, sending incredulous laborers up hillsides with shovels, sleeves rolled up and heads shaking in disbelief. We owe a great deal to those brave men and women, without whom our Riesling would be sour and our Pinot Blanc flat. Indeed, a crowning achievement of Western civilization was built on hillsides with their hands, to which no museum is dedicated. I ask, then, but one thing of my readers: the next time a glass is poured, especially a glass of German wine, think of the Weinberg, and think of the hands, the backs, the joints, the tools of the artists who have painted the European landscape, for the sake of that glass.